Huge Savings Item! Save 13% on the Oki Data C831dn Color Digital Printer Series (30/32ppm), 120V (E/F/P/S) by OKI at Pacs BG. MPN: C831dn. Hurry! Limited time offer. Offer valid only while supplies last. 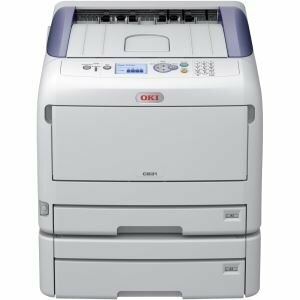 Oki Data C831dn Color Digital Printer Series (30/32ppm), 120V (E/F/P/S). Print Letter/A4 up to 35ppm color and mono, Tabloid/A3 up to 20ppm. Oki Data C831dn Color Digital Printer Series (30/32ppm), 120V (E/F/P/S). Print Letter/A4 up to 35ppm color and mono, Tabloid/A3 up to 20ppm. Long-lasting 30,000-page image drum. Paper capacity up to 1,460 sheets. High-capacity 10,000-page toner cartridges. ENERGY STAR Compliant. Tabloid/A3 Color Printers with compact design, media versatility, and incomparable print quality.